It’s party time! And that means we need some easy appetizers. 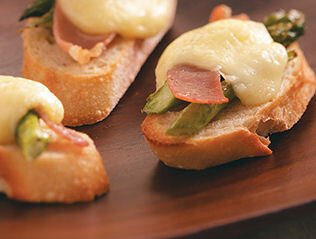 Party appetizers like these asparagus crostini appetizers and easy to make, easy to serve and easy on the taste buds! These appetizers will just disappear from the serving plates at your next party. A loaf of toasted French bread is the base to add tender asparagus spears, thinly cut proscuitto. Top it all off with some Gouda cheese and into the oven and they are done! Ingredients for the asparagus crostini appetizers. If you like crostini appetizers, check out these four ideas for your next party.